The domain-specific track evaluates retrieval models for structured scientific bibliographic collections in English, German and Russian. 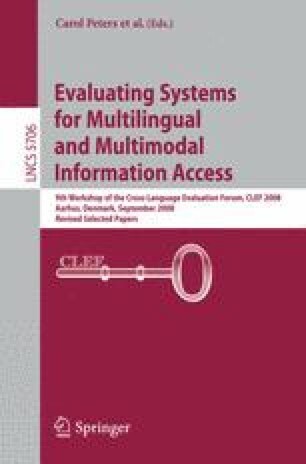 Documents contain textual elements (title, abstracts) as well as subject keywords from controlled vocabularies, which can be used in query expansion and bilingual translation. Mappings between the different controlled vocabularies are provided. In 2008, new Russian language resources were provided, among them Russian-English and Russian-German terminology lists as well as a mapping table between the Russian and German controlled vocabularies. Six participants experimented with different retrieval systems and query expansion schemes. Compared to previous years, the queries were more discriminating, so that fewer relevant documents were found per query. The year 2008 marked the last year of the domain-specific track, a special issue of important experiments and results is planned. H.3 [Information Storage and Retrieval]: H.3.1 Content Analysis and Indexing; H.3.3 Information Search and Retrieval.